Order one for each NH office and location to be fully compliant. 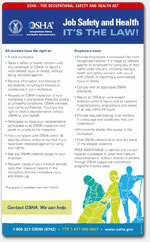 The OSHA poster is included on the New Hampshire Complete Labor Law Poster. When you order the New Hampshire Complete Labor Law Poster, it will satisfy your State, Federal, and OSHA posting requirements with one poster. 07/2017 - Payment of Wages Poster - Updated Protective Legislation Law to reflect new requirement mandating that wages be paid on a weekly or biweekly basis. 12/2014 - Equal Pay for Equal Work Act - New posting requirement regarding "Equal Pay" law. 01/2008 - Minimum Wage Poster - Reflects new minimum wage rates of $5.85 per hour effective July 2007, $6.50 per hour effective September 2007, $6.55 per hour effective July 2008, and $7.25 effective September 2008;Update in minor labor law section. 01/2008 - Independent Contractor or Employee - Completely revised text/regulations. 05/2014 - Payment of Wages Poster - Updated to reflect new Deputy Labor Commissioner, Kathryn J. Barger. 05/2014 - Whistleblower Protection Act - Updated to reflect new Deputy Labor Commissioner, Kathryn J. Barger. 05/2014 - Minimum Wage Poster - Updated to reflect new Deputy Labor Commissioner, Kathryn J. Barger. 05/2014 - Right to Know Act - Updated to reflect new Deputy Labor Commissioner, Kathryn J. Barger. 04/2014 - Whistleblower Protection Act - Updated with minor verbiage changes and new protection guidelines for potential whistleblowers. 10/2013 - Right to Know Act - Update reflects David M. Wihby as Deputy Labor Commissioner and James W. Graig as the new Commissioner of Labor and the addition of the State Seal. 10/2013 - Minimum Wage Poster - Update reflects David M. Wihby as Deputy Labor Commissioner and James W. Graig as the new Commissioner of Labor. 10/2013 - Whistleblower Protection Act - Update reflects David M. Wihby as Deputy Labor Commissioner and James W. Graig as the new Commissioner of Labor. 10/2013 - Independent Contractor or Employee - Update reflects David M. Wihby as Deputy Labor Commissioner and James W. Graig as the new Commissioner of Labor. 10/2013 - Payment of Wages Poster - Update reflects David M. Wihby as Deputy Labor Commissioner and James W. Graig as the new Commissioner of Labor. 10/2012 - Right to Know Act - Updated Labor Commissioner. 10/2012 - Minimum Wage Poster - Update to Minimum Wage poster, deleted minimum wage postings for 2006 & 2007 and added new regulations for tipped employees. 10/2012 - Payment of Wages Poster - Minor changes include updated State Seal and updated Labor Commissioner. 08/2012 - Whistleblower Protection Act - Update to Whistleblower Protection law, giving new guidelines on reporting obligations & rights of employees. 02/2012 - Unemployment Compensation - New logo and updated list of employment security offices in New Hampshire. 02/2012 - Vacation Shutdown Notice - New logo, new website and updated list of employment security offices in New Hampshire Unemployment Compensation. Many industries such as the restaurant, retail, construction, and professional use the New Hampshire Complete Labor Law Poster to satisfy their compliance requirements for State, Federal, and OSHA. When posted in an area frequented by employees, the New Hampshire Complete Labor Law Poster puts a business in full compliance. Federal contractors and subcontractors are required to display more postings in addition to the general State, Federal, and OSHA regulations. Please click here to see the federal contractor and subcontractor posting requirements. Ensure your full compliance by posting the New Hampshire Complete Labor Law Posters with the federal contractor-required postings.